On 3 July 2013, the Heritage Institute for Policy Studies (HIPS) organized a Special Forum for Ideas with the Speaker of the Parliament Hon. Mohamed Sheikh Osman ‘Jawaari’. Speaker Jawaari presented to an audience of 85 civil society actors an overview of parliament’s achievements in the previous two sessions, the challenges the legislature currently faces, and future plans. Prominent civil society leaders, academics, business leaders, traditional elders, and youth activists attended the event and participated in a Q&A session following the presentation with questions ranging from the crisis in Kismaayo and the detention of Sheikh Hassan Dahir Aweys, to the Speaker’s overseas trips, the conduct of MPs, and the provisional constitution. The Q&A session, lasting over two hours, included queries from Somalis across the globe using Twitter. Local and international media outlets covered the event and HIPS staff tweeted remarks of participants and responses of the Speaker live. 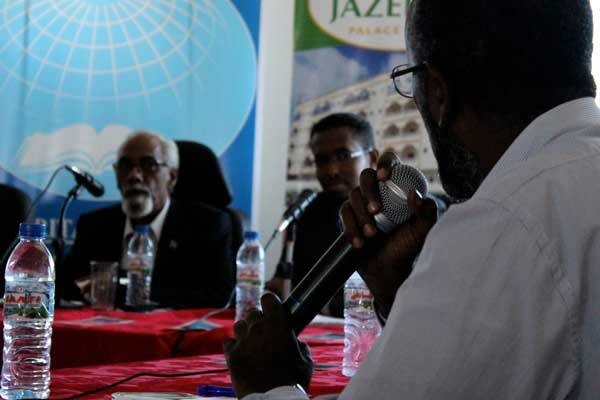 A veteran civil society leader and an erudite speaker with extensive experience of the inner workings of the parliament and government machinery, Speaker Jawaari was at ease with the audience and answered all questions posed by the participants. The number one priority of the parliament, Speaker Jawaari told the audience, is ensuring that there is a fair and free election in Somalia in 2016. The Speaker announced that parliament had just passed its first law regarding amendments and implementation of the draft constitution. A HIPS report on the Special Forum with further details is forthcoming. This entry was posted in Forum for Ideas and tagged #askthespeaker, Heritage Institute for Policy Studies, HIPS, Jawaari, Mogadishu, Somalia, Speaker, speaker of Parliament. Bookmark the permalink. Post a comment or leave a trackback: Trackback URL.